Download Hour1 Download Hour2 We continue our study of the deep state with a fresh look at what has emerged about the defining 21st century deep event, the attacks of September 11th. While that date inevitably invokes mental images of fireball and collapsing towers, we look instead at the financial implications. These range from Stratesec director Wirt Dexter Walker's $50,000 insider trade through a range of mid level fraud, up to the hundreds of billions of US Bonds which were due on that date and the trillions of dollars which have gone missing from the Pentagon budget. What does this complex pattern of innumerable financial frauds carried out on that day tell us about the interrelationships of the shadowy cabal of deep state insiders who pulled it off? And what about the technologies which may have been used on that day? Last episode we looked in more detail at a European deep state milieu, the Bilderberg Group. This time, we look at a structural deep event, 9/11. 14 years on, with Larry Silverstein still pursuing legal action to try to make yet more money from the "financial disaster" that hit him that day (when the destruction of buildings valued at $1.2 Billion was followed by the largest insurance payout in history, $4.55 billion). 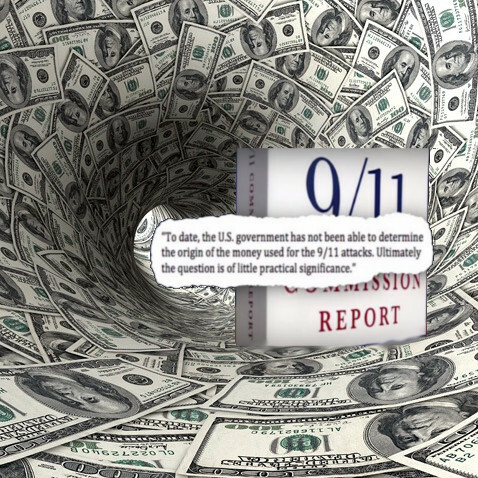 We begin the show with a first rate and up to date investigation into "The 9/11 Money Trail" by James Corbett. Call options (profit for price increase) on Raytheon, other manufacturers of arms, surveillance equipment and profiteers from the "War on Terror" about to be launched. Why, considering the mound of evidence out there, did the SEC investigation conclude that it could find no evidence that insider trading was carried out by those involved in the 9/11 attacks? Considering, for example, that 2000 contracts taken out on United Airlines the Thursday before the attacks, that is 90 times more in a single day than usually happens in 3 weeks, lack of evidence does not seem a plausible explanation. Lack of funds or staff also seems not to be a credible explanation, considering that their inquiry was carried out in conjunction with the FBI, the Treasury Department, and the Department of Justice, and was unprecedented in its scale. The investigation appeared to take it as axiomatic that having "no conceivable ties to al Qaeda" meant that the trading parties had no foreknowledge of the attacks. If the outcome of the inquiry was a foregone conclusion, why make it so extensive? Was it all just a big exercise in whitewashing, fixing an official narrative? Or could there have been more at stake, perhaps a thorough investigation of the money trail, in order to purge it once an for all, to investigate who had breached protocol and tried some private profiteering on the side? Could it have actually been an effort to carry out a kind of housekeeping similar to Tim Tate's movie Conspiracy of Silence (that we heard at in episode 720) to gather up and then destroy all the available evidence? For whatever reason, when asked by FOIA requests for the documents on which they concluded that no insider trading had taken place, the SEC stated that those documents had been destroyed. We conclude the show with the sound track of a YouTube video report of the deep state actors and military technologies that came together to create the structural deep event 9/11. The emphasis is on intelligence related individuals and groups rather than financial crimes. Although it is from 2012, it is densely packed and complements Corbett's piece quite well, overlapping as regards the revelations of Richard Grove - it appears quite consistent in exposing parts of a large syndicate of deep state actors utilizing the apparatus of the public state and/or whatever other means were available to advance their own socio- and psychopathic agendas. This page was last modified on 8 November 2015, at 08:01.